I feel like a real bike-tour veteran now, having finished the last two days of biking without a single incident of getting lost or riding the relief van. Of course it helped that both days we biked along the Danube and the course was mostly flat. 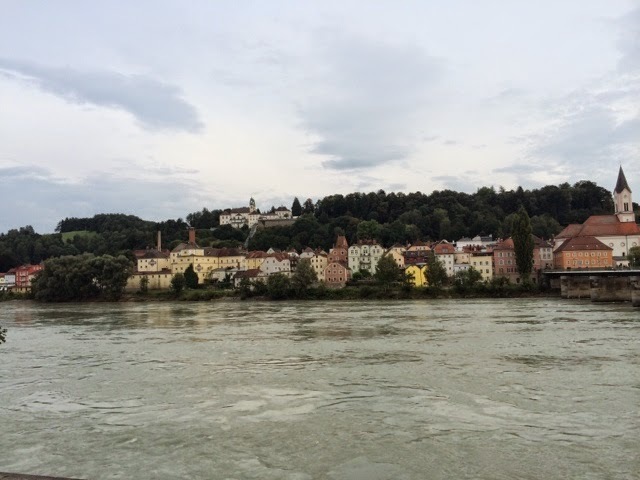 On Sunday we took a river barge from Passau to Schlogen, and then biked along the Danube to Ottensheim - a distance of 32 miles. About 3/4 through the ride, we crossed a dam, just as hail began to strike us. Fortunately it was a brief shower, it never rained hard, and it came toward the end of the ride. However, we then had another transport - by bus - to our hotel in Weissenkirchen. It was a lot of transports in one day, and the need to meet the bus meant there was some pressure to finish the ride a bit faster than I would have liked. While I love having the van support and the company making arrangements and figuring out good routes, I definitely prefer going at my own pace - and would have liked more freedom to stop for photos or just a little rest. 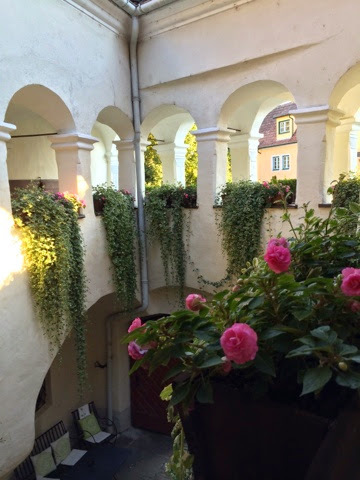 Our hotel in Weissenkirchen was quite impressive, however: an ancient building in a renaissance village. It felt like stepping into a fairy tale. 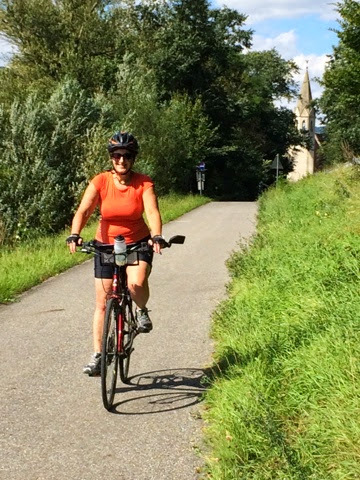 Our final day of cycling was a 40 mile loop, cycling upstream from Weissenkirchen to Melk, where we stopped for lunch. I was desperate for vegetables. The hardest part of traveling in Bavaria is the meat-heavy culture...a true carnivore's paradise. 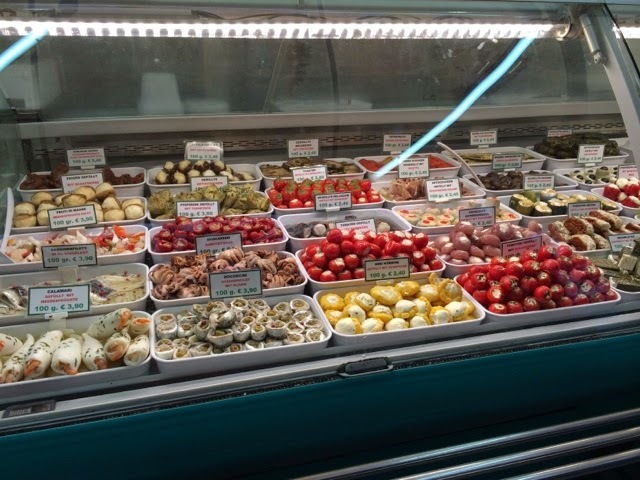 I've had plenty of delicious whole grain, seeded breads, cheeses and tasty yogurt, and plenty of fruit. And I've been the lone person loading up on the raw veggies always included with breakfast. 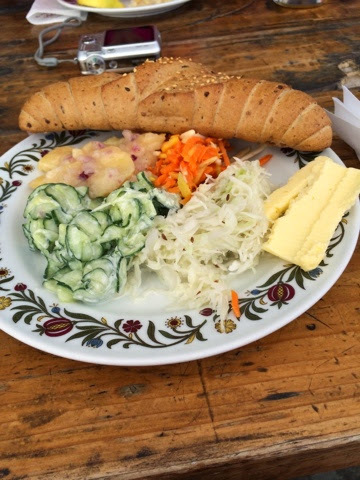 I walked round and round Melk and finally - in the butcher store- I was able to get a plate filled with 4 different vegetarian salads: cucumber, potato, cabbage, and a carrot/turnip blend - all delicious. I practically licked the plate! 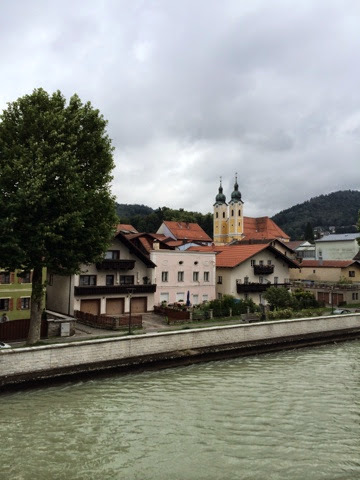 From Melk, we crossed to the other side of the Danube and biked beyond Weissenkirchen to Durnstein, taking our bikes across the river on a tiny ferry. I biked most of the day with Katia and we took it slowly, stopping often for photos. I was proud of finishing 40 miles and we had the most perfectly glorious weather - sunny and temperatures in the mid 60s to low 70s. The ride upstream took us through many small villages and the ride along the other side was more rural - with many of the vineyards that produce the region's white wine. The color of the Danube indeed was a lovely shade of sage green, as once it blended with the Inn river in Passau it contains glacial sediment from the Alps. My one regret of the day was that I didn't know in advance that there was a beach by the ferry to Durnstein. It would have been my one chance to dip my feet into the chilly waters, but alas, I was running late so I'll have to return for another chance. This morning we said goodbye to our VBT tour guides, who were unfailingly helpful and patient: Jan more animated and entertaining, and Andy more calm and low-key. We took a bus to Vienna, and it was a bit of a shock to be back in an urban environment...not such a welcome one, but perhaps a good transition before I have to return home. 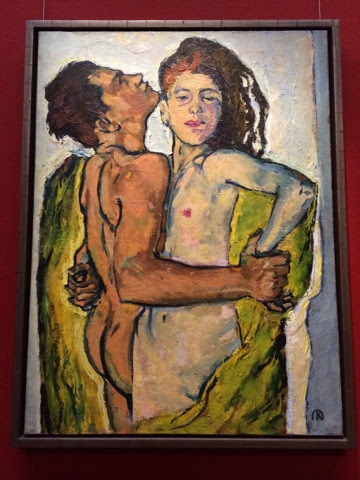 I wore my feet out walking, getting a little lost, tasting yummy foods at the naschmarkt, viewing amazing art at the Leopold Museum (featuring Egon Schiele - one of my favorites - who tragically lived only to the age of 28). Exhausted, I took the metro back to my hotel, discovering that I just barely qualify for senior-priced tickets (two rides for €2,80...less than $2/ride). I also got senior admission to the museum - yay! Two more days to explore Vienna, and then home...with strong thighs and fond memories. 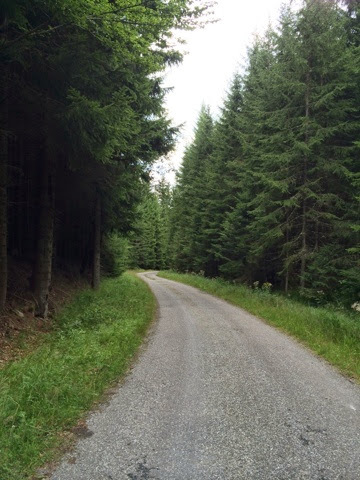 After getting off the route because of lagging behind on my first full day of cycling through the Czech Republic, yesterday I determined to stay with the front of the pack - a decision that led to a grueling 4.5 mile steady uphill climb. Yes, my trip-mates took a wrong turn from the start, and nearly the entire group followed. But half the "sheep" were rescued by one member having a bike malfunction. When one of the guides came to help, he sent that group the right way, but didn't realize that 6 of us were heading up, up, up the mountain. We realized the route was considerably harder than a "beginner" trail, but - well - I had thrown in my lot with the competitive, overachiever faction. We ended up having to retrace the entire 4.5 miles back down, which was obviously faster...but then we still had 15 miles to go for lunch - along the flat scenic river route. 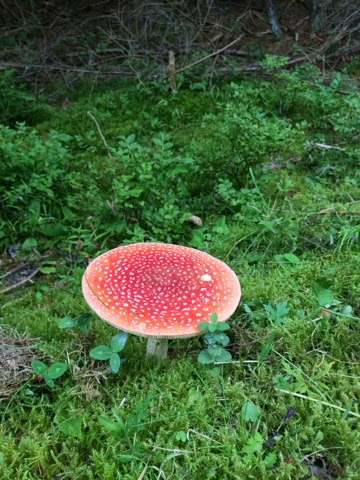 I did manage to get a photo of a spectacular mushroom. As soon as we crossed the border into Germany the landscape changed from forest into neatly manicured farmland, which was so picture-perfect I felt like I was in a Playskool diorama. After lunch I was exhausted and took the so-called "van of shame." I was glad I did, because even the most fit of our group admitted the last stretch had punishingly intense hills. I would not have made it! 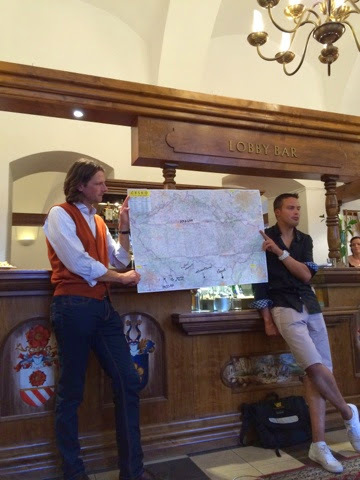 At this morning's pre-ride briefing, I finally asked the questions I should have asked on day one and learned how to properly read the daily cue sheet we get that explains the route. The one young couple in our group were the only ones who followed the directions correctly the previous day, and I realized that meticulous following of directions really matters. 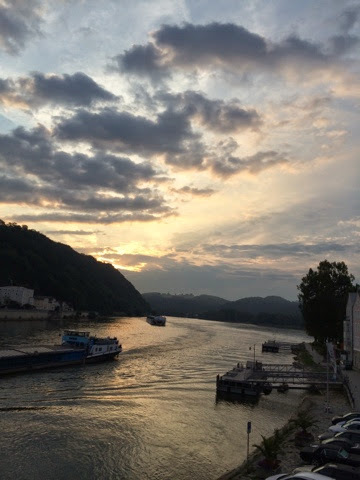 Today was our "easy" day - biking along the Inn River along the German side from Passau, and returning along the Austrian side after crossing at Scharding. I was proud of myself for not getting lost once! 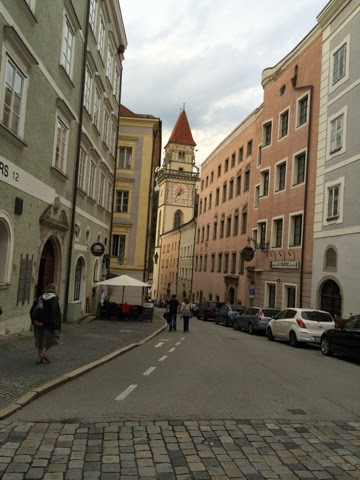 I spent the afternoon wandering through Passau. Being Saturday there was a flea market, which had the usual assortment of interesting antiques and outright junk. I felt proud that my initial beginnings of conversation with vendors led to long German explanations as to the great value of the objects I'd enquired about. 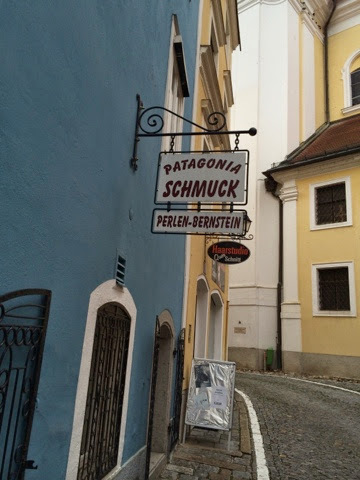 While I couldn't understand what they were saying, my accent seemed to be good enough that they thought I could - that is until I admitted, "Ich verstehe nur ein bisschen Deutsch." I also took advantage of the opportunity to ease my tired muscles with another fabulous massage, though I admit my muscles still feel weary. Tomorrow we start the day with a barge down the Danube, and then cycle through Austria, from Schlogen to Linz - and I plan to read my cue sheet with care. There's a reason I chose a group tour for my first bike trip, and it's not just that I like the idea of a van hauling my luggage from town to town. No, have the proverbial "can't navigate my way out of a paper bag" sense of direction, and in the first two days of the trip I established those credentials by leading myself (and others who were foolish enough to get behind me) astray. But why focus on the mishaps? I'm safely back in my room, so all's well that ends well, as the Bard wrote. Yesterday's training ride through the countryside around Cesky Krumlov - a UNESCO World Heritage site, with its castle dating back to the 13th century- started off with a kidney-jiggling kilometer or so on ancient cobblestones. 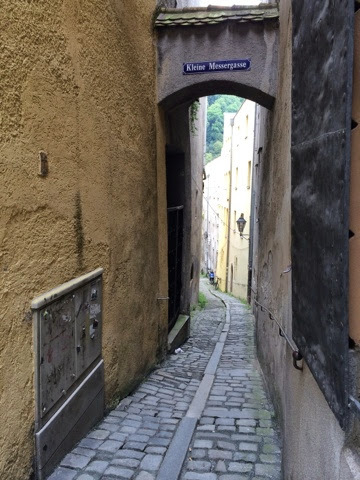 But then we hit the paved road and enjoyed the scenic farms and rolling hills just long enough to work up an appetite for dinner, which was served in the basement of a former catacomb, accessed by a low-ceilinged spiral staircase. But before dinner we had a welcome reception with introductions from our tour guides - Jan from Czech Republic and Andy from Austria - and our fellow cyclists: a group of 15, comprising 6 couples and 3 single women (yay - I was relieved to not be the only "third wheel".) 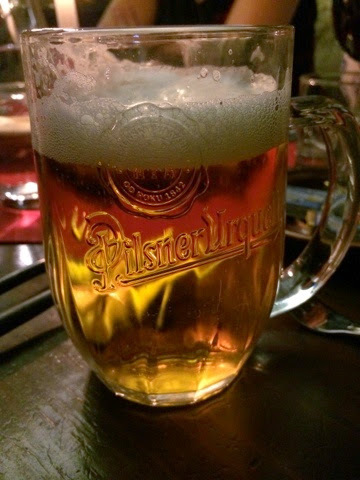 I'm not much of a drinker, but beer is such a part of the Czech culture (with the world's highest per capita consumption - so they told us) that I decided to sample the local brew. Wow! It was exceptionally tasty and flavorful and I was glad I gave it a try. This morning we started in the village of Holasovice, which I discovered has its own. 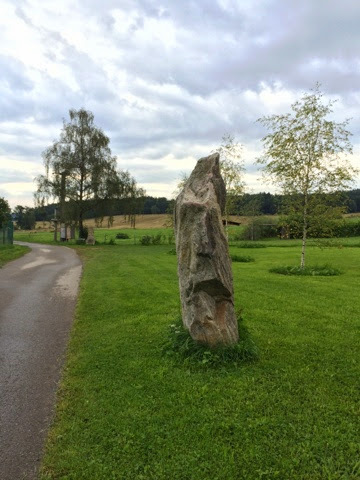 mini-Stonhenge, and cycled toward the town of Plav. The temperature was perfect, low 60s and overcast, with just an occasional light sprinkle. While I had been keeping mostly with a cluster of our group, I started paying more attention to my conversation with Katia - one of the other solo women, from Seattle - and before we realized it we had fallen behind the group and missed a turn. After some false starts, we called Jan who very graciously gave us directions back to the route. Throughout the countryside I noticed abundant fruit trees - just as I had in Prague. 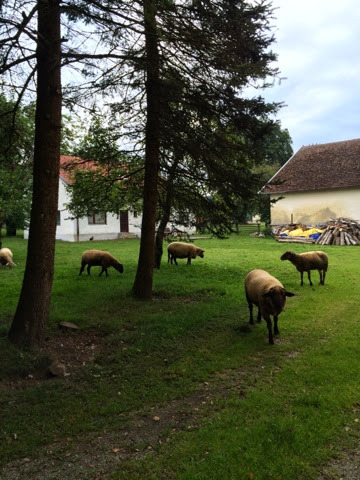 We arrived with a good appetite to the huge farmhouse where we were hosted to a family dinner that was the most delicious (and totally vegetarian-friendly) meal I've had in the CR: vegetable soup, salad, farmer's cheese sandwiches, a savory strudel...and more. During lunch the rain began, which helped me decide to take the van back to the hotel, instead of riding the additional 8 miles back. (The trip out had been about 15 miles). Physically, I could have done it, but the rain began in earnest, which just didn't appeal to me. Five of us took the van, and the rest braved the rain. It turned out to be a happy decision for all of us in the van - the cyclists got thoroughly drenched and cold. I have nothing to prove, and was happy to have the afternoon free to buy a few gifts. Later we all toured the castle which was quite impressive, and I was glad I had skipped Prague castle in favor of this one. My evening was rounded out by an hour-long massage - which was absolutely divine - for the absurdly low price of $25! I expect to sleep well tonight, windows wide open to cool fresh air, and the sound of the Vltava River rushing along beside me. Combine jetlag, a poor sense of direction, and an ancient city with winding streets and the results are predictable...getting lost. 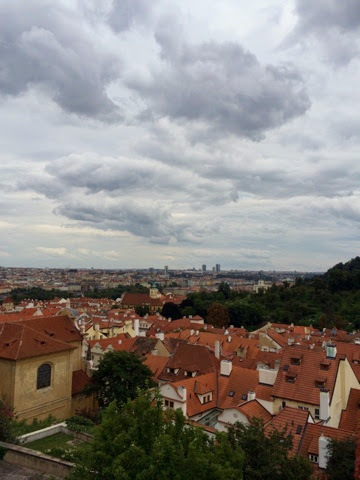 And when that city is Prague, with street names and numbering systems that are somewhat incomprehensible to a befuddled American, it's hard to navigate with efficiency. But vacation time isn't about being efficient. It's about making new and unexpected discoveries while wandering toward one destination and finding another. 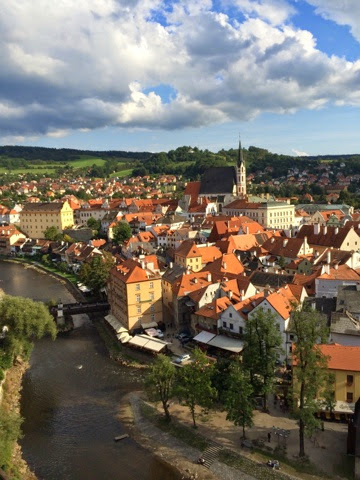 Yesterday, after a sleepless overnight flight, followed by a hotel nap, my goal was to find a vegetarian restaurant, and see the sights of the Moldau River, with it's many bridge crossings, and explore the old part of town. Clearly, this was tourist central, as nearly everyone I saw was holding a map and turning it in odd directions, looking as disoriented as I felt. 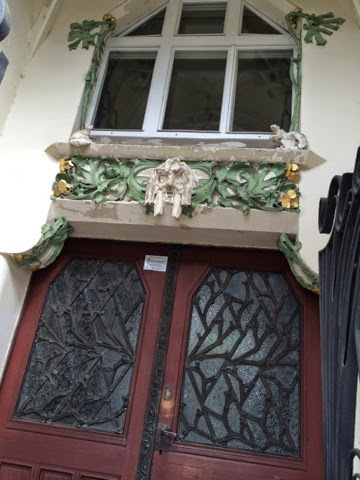 I enjoyed the street musicians, the extraordinary architectural details, and - just as I was about to give up, I found the veg cafeteria, which even had the poppyseed dumplings my friend Sarah had told about. There was a health food store next door where I picked up a few emergency supplies (a lot of Czech food is not very veg friendly). I then wandered past an open air market selling lovely berries and apricots. Today's agenda was based around following the self-guided tour along the #22 tram recommended by the Rick Steves guidebook I had checked out of the library. As I walked toward the tram line, I made note of some areas to explore later. The idea was to get away from the touristy part of the city and into a normal neighborhood. 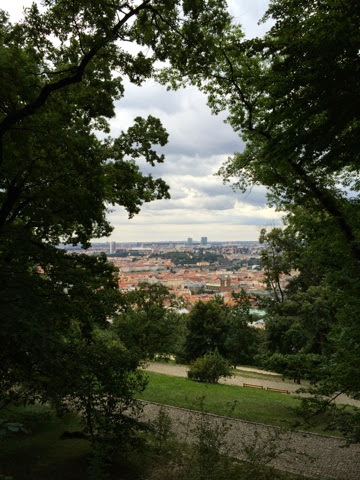 But quite soon I saw the entrance to Petrin park and could not resist the chance to ride the funicular to the top. 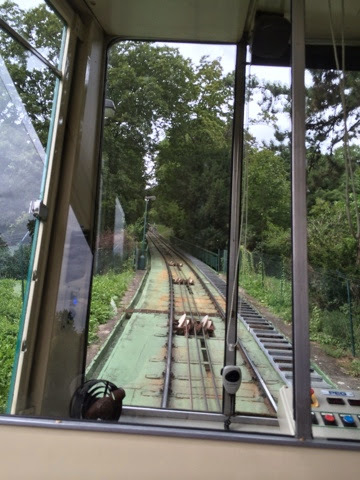 I mean really - how many chances does one get to ride a funicular? Looking at my map I decided I could walk through the park and pick up the tram line on the other side, continuing toward my original destination. Naturally, I first walked the wrong direction, but got to see the tower resembling a mini-Eiffel Tower. 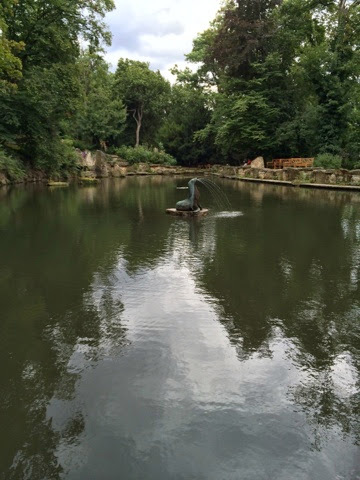 I passed up the chance to climb it, instead walking the other direction through the park - which turned out to be a magical wonderland of twisting cobblestone paths, trees, ponds, and views of Prague's famous red rooftops. I had no idea where I would come out, but every time there was a fork in the path I chose the option that seemed to head more downhill. I was impressed by the hardy bicyclists who had pedaled to the top of the park! When I reached street level, there was a map store - yay - where I invested in something a bit more helpful than the resources I'd started with and, even better, a helpful clerk who pointed me in the right direction. As usual, my instinct would have taken me the wrong way. As I headed west on the tram, the driver announced that it was the end of the line...two stops before where I thought I was going. The next tram driver told me I could take a bus, but as I was waiting I managed to find a wifi connection and discovered I was just half a mile from where I was headed. As I walked it became clear why the guidebook let me down: there was major road construction tearing up the tram lines. Serves me right for relying on an out-of-date book. By then I had to find a restaurant that had a restroom and something I could eat that was not pizza or Asian food. Why come all the way to Prague for that? After much looking I found someplace serving what turned out to be a somewhat strange combination of beets in a cumin and cashew sauce, with a big round of warm goat cheese and little fried potato pancakes. It (and the WC) hit the spot. From there I made my way to Prague castle - again, with going the wrong way and making some forays along the old city wall. By the time I reached the castle I found the whole thing overwhelming. It's an enormous complex of buildings swarming with tourists...but nothing resembling a "castle." I was expecting a medieval-looking fortress and instead a bit of reading informed me that it had all been rebuilt numerous times over the years. So I contented myself with wandering through the compelx without going inside and coming out the other end. 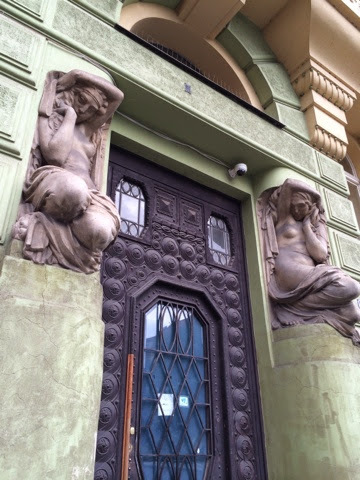 Tomorrow - who knows - perhaps the Jewish quarter, on my last full day in Prague before the biking part of my trip begins.